Introducing one of the best, if not the best, restaurants in the world: the very renowned, famous and eponymously named Restaurant Gordon Ramsay. This three-Michelin starred restaurant was founded by none other than you-know-who, the most eminent chef today, well-known for his notoriously aggressive demeanour and foul-mouth in his TV shows like Kitchen Nightmares and Hell’s Kitchen. Well, to be fair, his achievement to date (currently holding more than 10 Michelin stars worldwide), and the respect he commands in the culinary world warrants him to be such an… ahem… jerk, to put it nicely. But I’m not complaining, as long as my food isn’t going to be assessed by him! 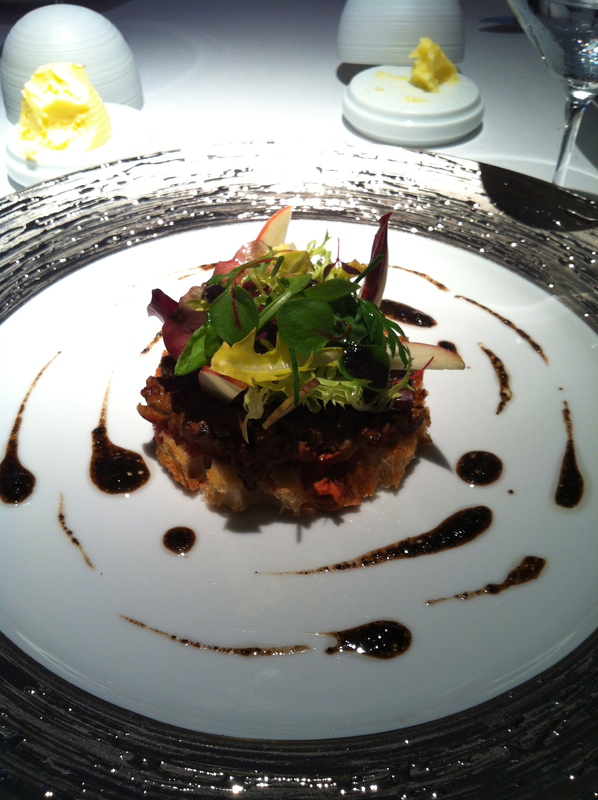 What I want is to sample his masterpieces, and so I went down to his flagship restaurant somewhere in April this year. Armed with a student budget, my best bet was the set lunch menu Restaurant Gordon Ramsay without going broke for the rest of the month. It was £55 for a three course meal, and it came along with an assortment of bread and butter for a pre-starter and also two other complimentary dishes which I felt really gave me a bang for my buck! I don’t have pictures for the assortment of bread, but I still remember the bacon and onion brioche bun being the most exquisite. However, do hold your horses: you don’t want to fill your stomach before the real deal comes! First up was one of the complimentary dishes: a pea mousse. 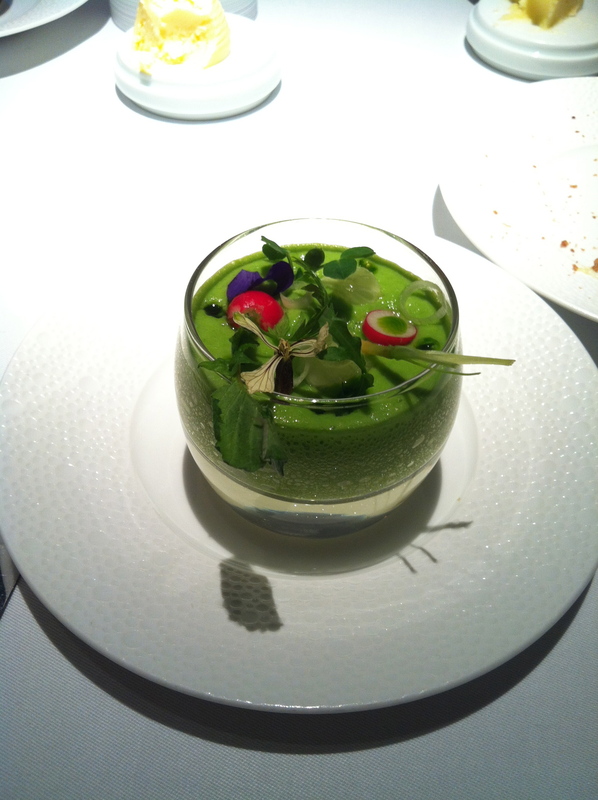 It was visually stunning and looks like a little veggie garden in a small glass. When you edge your spoon onto the surface of the mousse, everything magically deflates into somewhat a foamy green concoction. And though it might look really simple, the green foam literally bursts with flavour when it meets the tongue. It was an absolute delight given it was a complimentary dish. I would most definitely pay for one of these again. Next up was the starter I had chosen: foie gras with truffle vinaigrette. Again, no surprise that it was visually gorgeous. I should however add that this dish is no longer on the current set lunch menu. That said, I felt there was too little foie gras and it seemed like it was mixed with too much chicken liver to make up for its lack in quantity. But then again, I ordered the set lunch menu so who was I to complain! It would be definitely 5/5 if it was served in any other restaurant, but because it’s Mr Ramsay’s flagship restaurant, I certainly had higher expectations. 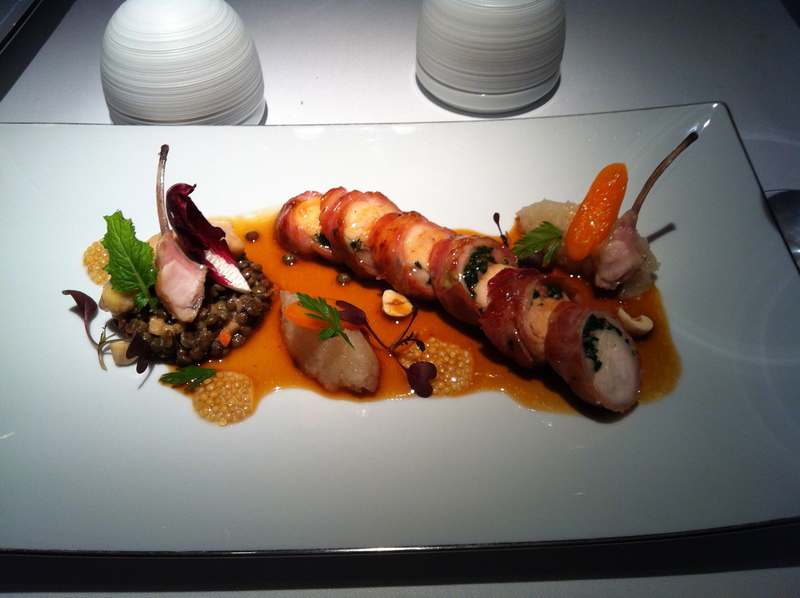 Then came the main course that everybody had been waiting for: roasted rabbit loin wrapped in Bayonne ham. Up till this stage, the presentations of the past dishes were really good. But when the main course came, it knocked our socks literally off. This dish just took the notion of plating up to the next damn level. It was just spectacular and awe-inspiring like an art painting worthy of being frame. I don’t know about you but I’ve never seen a dish this beautiful before. And, of course, the taste: beyond exquisite. I chose this primarily because I haven’t tried rabbit meat before and it was lush. I daresay that that cute little bunny had died for a good cause. Every element in the dish was extremely flavoursome and the flavours went really well together. It felt as if there was an orchestra in my mouth. I must say I was thoroughly impressed. Gordon Ramsay does live up to his name. 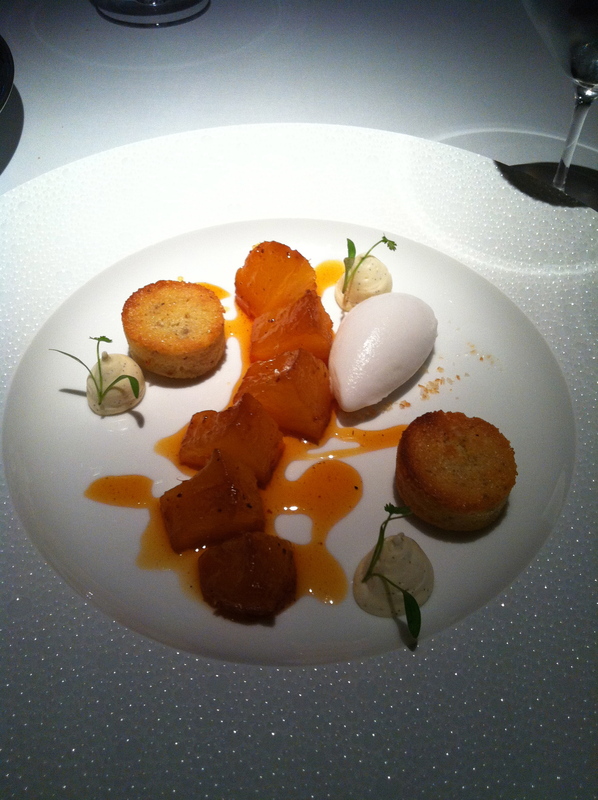 I felt sad when I finished the main course, but was delighted again when presented with the dessert: roasted pineapples with coconut sorbet and vanilla cream. A great dish for a sweet tooth like me. The roasted pineapples were warm, sweet and juicy and just melts in your mouth as if you were eating a block of honey. The coconut sorbet was light so it wouldn’t cause an over-sensation of sweetness in your mouth. Overall an awesome dessert. Just when we thought that our lunch was over, the second complimentary dish arrived! Our waiter had come with a metallic canister and when opened, liquid nitrogen smoke emerged. Inside were little ice-cream balls coated with a chocolate shell. It had a nice touch to it and a great way to culminate our lunch at Gordon Ramsay’s. Overall, if you’re a foodie in London and you haven’t tried Restaurant Gordon Ramsay, I urge you to do so, even if you have to scrimp and save for a month to afford it. For £55, you get a three-course meal with two complimentary dishes at probably the best restaurant in the world: what more can you ask for! One advice if you’re thinking of going: BOOK EARLY!